Mumbai: Rishabh Pant notched up his second first class century in only his fourth game, a strokeful and unbeaten 155, to keep Delhi in the hunt for the first innings lead against Maharashtra in their Ranji Trophy Group B match. The left-handed Pant, who kept wickets for Delhi for almost two days during Maharashtra's massive first innings total of 635 for 2 declared, came in to bat when his side was in trouble at 135 for 3 and remained unconquered in a close of play tally of 376 for 5. Pant, who had represented the country in the last Under 19 World Cup in Bangladesh, batted in an aggressive fashion to strike 6 sixes and 21 fours off the 165 balls he faced till stumps on day three of the four-day match at the Wankhede Stadium. Pant's heroics were possible as he was let off thrice by the butter-fingered Maharashtra fielders - on 33, 62 and 93 -and went on to stitch together century stands worth 124 and 117 for the fourth and fifth wickets with Dhruv Shorey (71) and Milind Kumar (45). Delhi were 51 for two before the innings was steadied by an 84-run partnership between Shorey, who struck 7 fours in 158 balls, and Nitish Rana (44). Maharashtra pegged Delhi back a bit in the last over to stumps with the second new ball as Mohsin Sayyed, easily the team's most impressive bowler, sent back Kumar caught behind to end the fifth wicket partnership. Delhi were 259 runs behind Maharashtra at stumps on a track that still played true without showing many signs of wear and tear as hardly a ball misbehaved throughout the day. For Maharashtra, Sayyed, who should have had Kumar caught by wicket keeper More when the batsman was on 4 in a Delhi score of 266 for 4 - returned with good end of day figures of 3 for 73, including that of rival captain and opener Unmukt Chand for 24. The more experienced Shrikant Mundhe and off spinner Chirag Khurana picked up the other two wickets to fall. Maharashtra: 635 for 2 decl. Delhi: 376 for 5 (Dhruv Shorey 71, Nitish Rana 44, Rishabh Pant not out 155, Milind Kumar 45; Mohsin Sayyed 3n for 73). Visakhapatnam: Aniket Choudhary grabbed five wickets while his pace colleague Pankaj Singh took four as Rajasthan ripped through Assam second innings batting line-up in a sensational bowling display to register an innings win in their Group B Ranji Trophy match. Assam, who had scored 195 all out in their first innings, lasted just 20.2 overs in their second essay as they were bowled out for 69 as Rajasthan won the match by an innings and eight runs. Only three of the Assam batsmen reached double-digit scores and five batsmen were out for duck. The abject surrender of Assam batsmen against the Rajasthan pace duo of Aniket (5/35) and Pankaj (4/26) could be seen as Rashav Das top-scored with 16 while the next best was a 14 by Arup Das. The best partnership for Assam was the 23 for the eighth wicket between Arup Das and Rishav Das. Earlier, Rajasthan first innings folded at 272 after resuming the day at 208 for 3. Mahipal Lomror top-scored with 89 off 242 balls as he could add just five runs to his overnight 84. Rajasthan collected all the seven points while Assam got none. Assam: 195 & 69 in 20.2 overs (Aniket Choudhary 5/35, Pankaj Singh 4/26). Rajasthan: 272 all out in 105.4 overs (Mahipal Lomror 89; Arup Das 4/53). Kolkata: Himachal Pradesh notched up a six-wicket win over Kerala in their Group C Ranji Trophy cricket match. Chasing a meagre total for victory, Himachal raced to 103 for the loss of four wickets in 25 overs at the Eden Gardens. Karaparambil Monish picked up 3/31 for Kerala. For Himachal, Gurvinder Singh was the best bowler, returning impressive figures of 5/37 in 15.5 overs, while Mayank Dagar and Rishi Dhawan had three and two wickets respectively. 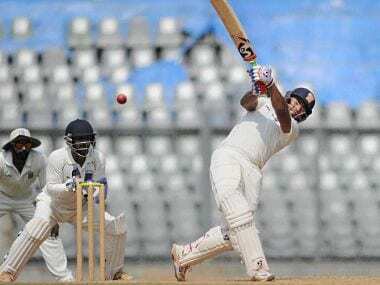 New Delhi: Opener Kedar Devdhar hit a stroke-filled 145 as Baroda took a sizeable lead of 303 runs, despite narrowly falling short of Mumbai's first innings total, on the third day of their Ranji Trophy Group A match. Devdhar's knock came of 235 balls that included 16 fours as Baroda finished the day at 321 for five. With a day's play left, Baroda will try for an outright win as Mumbai have already ensured three points by virtue of 18-run first innings lead. With Aditya Waghmode (66), Baroda added 177 for opening stand before Deepak Hooda (66 batting, 75 balls) attacked the Mumbai bowlers with six boundaries. Devdhar and Hooda added 57 runs in 12.4 overs to up the ante. Pathan brothers Irfan (12) and Yusuf Pathan (2) were dismissed cheaply. The day belonged to Devdhar, who was brilliant and was especially severe on Shardul Thakur (0/57) and Balwinder Singh Sandhu Jr (1/71), treating any width offered with disdain. Just when Devdhar was looking good, he edged one off Sandhu Jr's bowling. Baroda: 305 & 321/5 (Kedar Devdhar 145, Deepak Hooda 66, Aditya Waghmode 66). Jaipur: Bengal earned vital first innings lead of 56 runs against Uttar Pradesh despite a commendable effort from centurion Umang Sharma and Sarfaraz Khan. In reply to Bengal's first innings lead of 466, Uttar Pradesh were all out for 410 in 112.4 overs. Umang (136) and the burly Sarfaraz (85) added 139 for the fourth wicket but that wasn't enough to ensure at least three points for UP. At stumps, Bengal were 30 for no loss with a consolidated lead of 86 runs with a day's play left. Starting the day at 126 for 3, the duo took the score to 188 before the RCB batsman was caught by Abhimanyu Easwaran off Sayan Sekhar Mondal's bowling. He faced 124 balls. Skipper Ekalavya Dwivedi (17) didn't stay long as he was cleaned up by Sayan Ghosh. Once Umang became the seventh batsmen to be dismissed as he failed to read a flighted delivery from Pragyan Ojha (2/101) offering a simple return catch. UP were 321/7 then. Kuldeep Yadav (63, 100 balls) also tried his best with Piyush Chawla (34) and Imtiaz Ahmed (26 batting) also making contributions but off-spinner Aamir Gani (3/72) both Chawla and Yadav. UP 1st Innings: 410 in 112.4 overs (Umang Sharma 136, Kuldeep Yadav 63, Sarfaraz Khan 85, Amir Gani 3/72, Pragyan Ojha 2/101). Bilaspur: Unbeaten half-centuries from openers Saurabh Wakaskar and SS Shukla provided Railways with a solid start in their chase of 401 runs on the penultimate day of their Group A Ranji Trophy encounter against Tamil Nadu. At the close of play, Wakaskar was unbeaten on 54 and Shukla was on 52 with Railways needing 293 more runs for an outright win with all the wickets intact. Earlier, resuming on 161 for one, Tamil Nadu skipper Abhinav Mukund (100) and Dinesh Karthik (163) scored a ton each, while Baba Indrajith (52) and M Rangarajan (51) chipped in with half-centuries to take the team to 452 for eight before declaring their second innings and set a huge target for Railways. Karn Sharma was the top wicket-taker for Railways with figures of four for 109. Railways, who had managed to take a 52-run first innings lead, need to score almost 300 runs tomorrow for a win. Tamil Nadu: 121 & 452 for 8 decl (Dinesh Karthik 163, Abhinav Mukund 100, Baba Indrajith 52; Karn Sharma 4/109). Railways: 173 & 108 for no loss in 25 overs (Saurabh Wakaskar 54, SS Shukla 52). Hyderabad: On a day when 13 wickets fell, Saurashtra were struggling at 96 for five at the end of the third day's play while chasing 212 for victory against Odisha in a Ranji Trophy Group B match. Saurashtra need 116 more runs with five wickets in hand. Resuming on 62 for two, ahead by 104 runs due to their first innings lead, Odisha failed to tighten the nooze as Saurashtra clawed their way back into the game with Deepak Punia's five for 39. Bowled out for 169 in their second innings with Subhranshu Senapati top-scoring with 57, Odisha took an over lead of 211 runs. Chasing a 212-run target for their first win of the season, Saurashtra lost two wickets in three balls in the fifth over, reeling at six for two, before an 84-run third-wicket stand between Sagar Jogiyani (42) and Sheldon Jackson (43) brought the team back into the game. However, in the fag end of the day, Odisha took three wickets in 31 balls for one run to leave the contest evenly poised. Odisha: 228 & 169 (Subhranshu Senapati 57; Deepak Punia 5/39). Saurashtra 186 & 96 for 5 in 52 overs (Sheldon Jackson 43; Dhiraj Singh 2/6). Rohtak: First-innings centurion Yuvraj Singh produced another fine knock before the captain made a sporting declaration to set Madhya Pradesh a target of 307 on the third and penultimate day of their Group A Ranji Trophy match. At stumps, Madhya Pradesh were 26 for one in their second innings at the CH Bansi Lal Cricket Stadium. Earlier, Yuvraj, who notched up 177 in the first innings, cracked 76 off 120 balls with the help of eight boundaries and a six. Yuvraj was ably aided by Taruwar Kohli (35) and together they added 94 runs for the fifth wicket before the team declared at 175 for nine in 51.3 overs. For Madhya Pradesh, Ishwar Pandey was the best bowler, returning figures of 3/25 in 14 overs. There were two wickets apiece for Chandrakant Sakure and Ankit Sharma. Play was called off for the day at the fall of opener Mukul Raghav's (16) wicket to Shubek Gill. Aditya Shrivastava was batting on 2. MP required another 281 runs for victory with nine wickets remaining. Surat: Riding on Parveez Rasool's five-wicket haul, Jammu and Kashmir posted a 116-run victory over Goa in a Group C Ranji Trophy match and earn full six points. Goa resumed on 22 for no loss, chasing 412, and openers Darshan Misal (42) and Swapnil Asnodkar (47) gave the team a good start by sharing a solid 87-run stand before medium pacer Samiullah Beigh got the breakthrough. Misal's dismissal triggered a collapse and Goa were suddenly reeling at 116 for four. Rasool then ran through the line up to pick up his seventh five-wicket haul; finishing with impressive figures of five for 89. Wicketkeeper Samar Dubhashi put up some resistance with an unbeaten 79, with the last two batsmen -- AG Pandrekar (20) and Felix Alemao (22) -- giving him company for close to 35 overs, but it was not enough to avoid the defeat in the end. Goa: 77 & 295 all out in 92 overs (Samar Dubhashi 79 not out; Parvez Rasool 5/89). Greater Noida: Wicketkeeper Ishan Kishan compiled a fine unbeaten century to guide Jharkhand to 309 for six on the third and penultimate day of their Group B Ranji Trophy match against Karnataka. Replying to Karnataka's mammoth first-innings total of 577 for six declared, Kishan scored his runs off 148 balls and hit 13 boundaries and five sixes at the Greater Noida Sports Complex Ground. Experienced hand Saurabh Tiwary struck 91 off 163 balls with the help of six fours and three sixes, while opener Anand Singh contributed 45 and hit seven boundaries. For Karnataka, Abhimanyu Mithun was the most successful bowler, picking up 2/54, while there was a wicket apiece Stuart Binny, Shreyas Gopal and Krishnappa Gowtham. 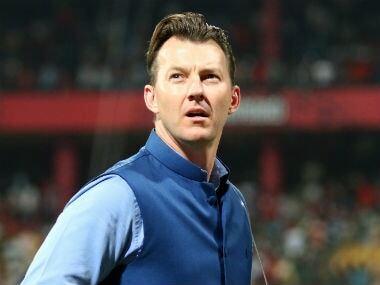 Jharkhand were overnight nine for no loss after being on the field for almost two full days. Jharkhand trailed by 268 runs with four wickets remaining when the stumps were drawn.